Syndactyly is the most common congenital malformation of the limbs, with an incidence of 1 in 2000-3000 live births. [1, 2, 3] It is a failure of differentiation in which the fingers fail to separate into individual appendages. This separation usually occurs during the sixth and eighth weeks of embryologic development. The term syndactyly is derived from the Greek prefix syn- ("with, together") and the Greek noun daktylos ("finger, digit"). Syndactyly can be an isolated finding, or it can be found in association with other abnormalities (eg, polydactyly, cleft hands, ring constrictions, and craniofacial syndromes). It is a shared feature of more than 28 syndromes, including Poland, Apert, and Holt-Oram syndromes. Classification is based on the severity of the clinical presentation (see Classification). Syndactyly can be classified as simple when it involves soft tissues only and as complex when it involves the bone or nail of adjacent fingers. Unreleased syndactyly can significantly impair finger and hand function. The impairment is worse when the syndactyly is complete, is complex, or involves the border digits with fingers of uneven lengths, such as the ring and small fingers or the thumb and index finger (see the images below). Complete simple syndactyly of ring and small fingers. Note ring finger proximal interphalangeal (PIP) joint flexion deformity due to complete syndactyly between border digits. Complete simple ring and small finger syndactyly. Note ulnar deviation of ring finger due to syndactyly of small finger. Syndactyly is the most common congenital abnormality of the hand, with a rate of 1 per 2000-3000 births. [9, 10, 11, 12] The male-to-female ratio is 2:1. Despite appearing relatively straightforward, syndactyly release is a complex operation requiring well-honed skills. If the procedure is properly performed, the rate of complications is low, and the results are extremely gratifying for the parents and beneficial to the patients in improving hand functionality and in providing normal-appearing hands and fingers. Schwabe GC, Mundlos S. Genetics of congenital hand anomalies. Handchir Mikrochir Plast Chir. 2004. 36:85-97. [Medline]. 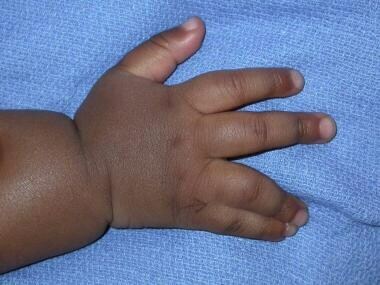 Mandal K, Phadke SR, Kalita J. Congenital swan neck deformity of fingers with syndactyly. Clin Dysmorphol. 2008 Apr. 17(2):109-11. [Medline]. Malik S, Afzal M, Gul S, Wahab A, Ahmad M. Autosomal dominant syndrome of camptodactyly, clinodactyly, syndactyly, and bifid toes. Am J Med Genet A. 2010 Sep. 152A(9):2313-7. [Medline]. Flatt AE. The Care of Congenital Hand Anomalies. 2nd ed. St Louis: Quality Medical Publishing; 1994. Malik S, Percin FE, Bornholdt D, Albrecht B, Percesepe A, Koch MC, et al. Mutations affecting the BHLHA9 DNA-binding domain cause MSSD, mesoaxial synostotic syndactyly with phalangeal reduction, Malik-Percin type. Am J Hum Genet. 2014 Dec 4. 95 (6):649-59. [Medline]. [Full Text]. Lazier J, Chernos J, Lowry RB. A 2q24.3q31.1 microdeletion found in a patient with Filippi-like syndrome phenotype: a case report. Am J Med Genet A. 2014 Sep. 164A (9):2385-7. [Medline]. Schatz O, Langer E, Ben-Arie N. Gene dosage of the transcription factor Fingerin (bHLHA9) affects digit development and links syndactyly to ectrodactyly. Hum Mol Genet. 2014 Oct 15. 23 (20):5394-401. [Medline]. [Full Text]. Man LX, Chang B. Maternal cigarette smoking during pregnancy increases the risk of having a child with a congenital digital anomaly. Plast Reconstr Surg. 2006 Jan. 117(1):301-8. [Medline]. Percival NJ, Sykes PJ. Syndactyly: a review of the factors which influence surgical treatment. J Hand Surg [Br]. 1989 May. 14(2):196-200. [Medline]. Eaton CJ, Lister GD. Syndactyly. Hand Clin. 1990 Nov. 6(4):555-75. [Medline]. Lamb DW, Wynne-Davies R, Soto L. An estimate of the population frequency of congenital malformations of the upper limb. J Hand Surg [Am]. 1982 Nov. 7(6):557-62. [Medline]. Light TR. Congenital anomalies: syndactyly, polydactyly, and cleft hand. Peimer CA, ed. Surgery of the Hand and Upper Extremity. New York: McGraw-Hill; 1996. 2111-44. Poland, Alfred. Deficiency of the pectoral muscles. Guy’s Hospital Reports. 1841. VI:191-193. De D, Narang T, Kanwar AJ, Dogra S. Brachycephaly and syndactyly: Apert's syndrome. Indian J Dermatol Venereol Leprol. 2008 Jul-Aug. 74(4):395-6. [Medline]. Patterson TJ. Congenital ring constriction. Br J Plast Surg. 1961. 14:1-31. [Medline]. Vekris MD, Lykissas MG, Soucacos PN, Korompilias AV, Beris AE. Congenital syndactyly: outcome of surgical treatment in 131 webs. Tech Hand Up Extrem Surg. 2010 Mar. 14(1):2-7. [Medline]. Agarwal A. Comment on Shevtsov and Danilkin: Application of external fixation for management of hand syndactyly. Int Orthop. 2009 Apr. 33 (2):581. [Medline]. Frick L, Fraisse B, Wavreille G, Fron D, Martinot V. [Results of surgical treatment in simple syndactily using a commissural dorsal flap. About 54 procedures]. Chir Main. 2008 Apr-Jun. 27(2-3):76-82. [Medline]. Jose RM, Timoney N, Vidyadharan R, Lester R. Syndactyly correction: an aesthetic reconstruction. J Hand Surg Eur Vol. 2010 Jul. 35(6):446-50. [Medline]. Dong Y, Wang Y. The use of a dorsal double-wing flap without skin grafts for congenital syndactyly treatment: A STROBE compliant study. Medicine (Baltimore). 2017 Jul. 96 (30):e7639. [Medline]. [Full Text]. Upton J. Congenital anomalies of the hand and forearm: syndactyly. McCarthy JG, ed. Plastic Surgery: The Hand and Upper Extremity. 3rd ed. Philadelphia: WB Saunders; 1990. Vol 8: 5279. Sharma RK, Tuli P, Makkar SS, Parashar A. End-of-skin grafts in syndactyly release: description of a new flap for web space resurfacing and primary closure of finger defects. Hand (N Y). 2009 Mar. 4 (1):29-34. [Medline]. Dillon CK, Iwuagwu F. Cavi-care dressings following syndactyly correction. J Plast Reconstr Aesthet Surg. 2009 Nov. 62 (11):e518-9. [Medline]. Lumenta DB, Kitzinger HB, Beck H, Frey M. Long-term outcomes of web creep, scar quality, and function after simple syndactyly surgical treatment. J Hand Surg Am. 2010 Aug. 35(8):1323-9. [Medline]. Barot LR, Caplan HS. Early surgical intervention in Apert's syndactyly. Plast Reconstr Surg. 1986 Feb. 77(2):282-7. [Medline]. Colville J. Syndactyly correction. Br J Plast Surg. 1989 Jan. 42(1):12-6. [Medline]. Wu JC, Cunningham BB. Ectopic acanthosis nigricans occurring in a child after syndactyly repair. Cutis. 2008 Jan. 81(1):22-4. [Medline]. McQuillan TJ, Hawkins JE, Ladd AL. Incidence of Acute Complications Following Surgery for Syndactyly and Polydactyly: An Analysis of the National Surgical Quality Improvement Program Database from 2012 to 2014. J Hand Surg Am. 2017 Sep. 42 (9):749.e1-749.e7. [Medline]. Canizares MF, Feldman L, Miller PE, Waters PM, Bae DS. Complications and Cost of Syndactyly Reconstruction in the United States: Analysis of the Pediatric Health Information System. Hand (N Y). 2017 Jul. 12 (4):327-334. [Medline]. Dorsal view of hand demonstrating simple incomplete syndactyly between left long finger and ring finger. Note incidental café-au-lait spot. Palmar view of hand with syndactyly. Level of syndactyly, just proximal to proximal interphalangeal (PIP) joint, can be clearly seen on this view. Dorsal view of hand of 1-year-old child with complete simple syndactyly. Note that both long finger and ring finger have distinct nail plates with trough separating them. Palmar view of hand of 1-year-old child with complete simple syndactyly. Dorsal view of hand of 6-month-old patient with type I Apert syndrome. Note that thumb is separate. Radial view of hand of 6-month-old patient with type I Apert syndrome. Index fingernail is separate, and syndactyly is complete. Small fingernail is also separate from rest of hand. Simple syndactyly between small finger and rest of hand is present. Note that broad thumb and abnormal curvature of thumb is due to presence of delta phalanx, seen in following radiograph. Radiograph of hand of 6-month-old patient with type I Apert syndrome demonstrates distinctive characteristics of this syndrome. In small finger, distal interphalangeal (DIP) joint is formed. Although rudimentary proximal interphalangeal (PIP) joint is present, clinically this joint is stiff. In ring, long, and index fingers, no PIP joint is present, and symphalangism is present between middle and proximal phalanges. Distal phalanges of ring and long fingers are fused. In thumb, proximal phalanx is shaped abnormally and is referred to as delta phalanx. Synostosis of ring and small finger metacarpals is present. Apert type II hand. Note complete syndactyly between ring and the small fingers. Patient's hand was complicated by chronic paronychia and skin maceration preoperatively. Apert syndrome (type III), dorsal view. Apert syndrome (type III), volar view. Radiograph of left hand of patient with type III Apert syndrome. Note complicated syndactyly with osseous union in distal phalanges of all fingers. Symphalangism is present between proximal and middle phalanges, without formation of proximal interphalangeal (PIP) joint in ring, long, and index fingers. Poland syndrome. Dorsal view of left hand in patient with Poland Syndrome with brachydactyly (short fingers) and adactyly (missing fingers) with associated simple incomplete syndactyly between ring and small fingers. Volar view of preceding hand in patient affected with Poland syndrome. Right hand of patient with Poland syndrome. Note incomplete syndactyly between hypoplastic right index and long fingers. Volar view of index and long fingers in incomplete syndactyly in patient with Poland syndrome. Dorsal view of right hand of a 1.5-year-old patient with constriction band syndrome. Fingers can still be identified individually. Note presence of fistula tract between affected fingers, particularly between long finger and ring finger. Palmar view of right hand of a 1.5-year-old patient with constriction band syndrome. Fingers can still be identified individually. Note presence of fistula tract between affected fingers, particularly between long finger and ring finger. Right hand of 1.5-year-old patient with constriction band syndrome. Radiograph demonstrates that level of amputation was at proximal interphalangeal (PIP) joints. Dorsal view of left hand of 1.5-year-old patient with constriction band syndrome. Left hand is more severely involved than right, with all fingers being nearly indistinguishable from one another. Note presence of pits between fingers where normal webs would be. Most prominent one is between ring and small fingers. They often represent fistulas between dorsal and volar surfaces of hand and are often all that remains of previous normal web space. Volar view of left hand of 1.5-year-old patient with constriction band syndrome. Left hand is more severely involved than right, with all fingers being nearly indistinguishable from one another. Note presence of prominent fistula between small finger and ring finger. Radiograph of left hand of 1.5-year-old patient with constriction band syndrome. Level of amputation is through midportion of proximal phalanges of involved fingers. Left hand of 1.5-year-old patient with constriction band syndrome after second reconstructive procedure following release of second and fourth web spaces. Syndactyly partially recurred because of skin-graft loss. During second-stage operation to separate long finger and ring finger, recurrences in second and fourth web spaces were re-revised. Thus, sutures are present on both sides of ring finger and long finger. Palmar view of right hand of 1.5-year-old patient with constriction band syndrome after previously staged syndactyly release. No skin graft was needed for release between long and ring fingers. Patient also underwent revision of web space between index and long fingers. Paronychia in patient with Apert syndrome. Despite use of oral antibiotics and topical antibiotic solution, paronychia did not fully resolve until fingers were divided. Left hand of patient with type II Apert syndrome. Hand has already undergone previous first-stage division. Bilateral releases were simultaneously performed to release border digits along with deepening of first webspaces using four-flap Z-plasty. Volar view of left hand of patient with type II Apert syndrome. Hand has already undergone first-stage division. Bilateral releases were simultaneously performed to release border digits along with deepening of first webspaces using four-flap Z-plasty. Left hand of patient with type II Apert syndrome. Picture was obtained 6 months after second-stage release was performed for central digits between long finger and ring finger. Surgical release was performed with standard zigzag incisions. Soft-tissue coverage for phalanges was sufficient after release; therefore, pedicle groin flap was not needed. Long finger and ring finger shared conjoint nail, which was also released successfully. This picture was taken during subsequent surgical revision of tracheostomy. Dorsal view of left hand of patient with type II Apert syndrome. Picture was obtained 6 months after second-stage release was performed for central digits between long finger and ring finger. Surgical release was performed with standard zigzag incisions. Soft-tissue coverage for phalanges was sufficient after release; therefore, pedicle groin flap was not needed. Long finger and ring finger shared conjoint nail, which was also released successfully. This picture was taken during subsequent surgical revision of tracheostomy. Dorsal view of hand of 1-year-old patient with complete simple syndactyly between long finger and ring finger. Typical zigzag incisions are marked on both dorsal and volar surfaces. Note length of dorsal trapezoidal flap design. Because flap must be inset at 45° angle with distal edge of web at midlevel of proximal phalanges, it must be long enough to achieve this goal. Volar view of hand of 1-year-old patient with complete simple syndactyly between long finger and ring finger. Typical zigzag incisions are marked on both dorsal and volar surfaces. Note length of dorsal trapezoidal flap design. Because flap must be inset at 45° angle with distal edge of web at midlevel of proximal phalanges, it must be long enough to achieve this goal. Note incidental simian crease. Hand of 1-year-old patient with complete simple syndactyly between long finger and ring finger. Picture was taken immediately after procedure. On dorsal view, note proximal skin graft on ulnar and radial sides of dorsal trapezoidal flap. 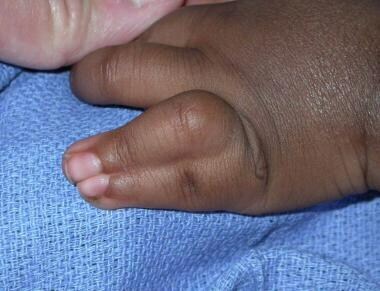 Hand of 1-year-old patient with complete simple syndactyly between long finger and ring finger. Picture was taken immediately after procedure. Dorsal view of left hand demonstrating simple incomplete syndactyly between long finger and ring finger. This incomplete simple syndactyly was released by using V-to-M flap without need for a skin graft. Note markings. Volar view of left hand demonstrates simple incomplete syndactyly between long finger and ring finger. Immediate postoperative results are shown. Note markings. Dorsal view of left hand demonstrates simple incomplete syndactyly between long finger and ring finger. Immediate postoperative results are shown. Simple incomplete syndactyly between long finger and ring finger. Immediate postoperative results are shown. Simple incomplete syndactyly between long finger and ring finger. One month later, hand has sufficiently deepened web. However, hypertrophic and hyperpigmented scars are still present along incision line. One month later, hand has sufficiently deepened web. However, hypertrophic and hyperpigmented scars are still present along incision line. Skin-graft donor site. Donor site in right inguinal region has healed well 10 months after patient's syndactyly surgery. Graft harvested was able to resurface two web spaces during bilateral web-space releases. Incision is inconspicuous. Hand of 23-year-old patient who underwent releases of simple complete syndactyly of both left third and fourth web spaces during infancy. Patient noticed progressive shortening of web space and found it hard to wear protective gloves, necessary for employment in fishing industry. This resulted in poor fit of the glove and chronic irritation of web. Note radial deviation of small finger due to contracture from patient's first surgery. Web space was deepened with local flaps and full-thickness skin grafts from left groin. Hand of 26-month-old patient who underwent release of complete simple syndactyly between left ring and long fingers with flaps and full-thickness skin grafts at 7 months of age. Patient developed hypertrophic scarring along incisions. This persisted despite conservative treatment with topical steroid cream and scar massage. Contracture was present mostly along ring finger, causing tethering of distal ring finger with mild radial deviation. Contracture was released with multiple Z-plasties and web deepened with small full-thickness skin graft. Hand of 26-month-old patient who underwent release of complete simple syndactyly between left ring and long fingers with flaps and full-thickness skin grafts at 7 months of age. Patient developed hypertrophic scarring along incisions. This persisted despite conservative treatment with topical steroid cream and scar massage. Contracture was present mostly along ring finger, causing tethering of distal ring finger with mild radial deviation. Hand of 26-month-old patient who underwent release of complete simple syndactyly between left ring and long fingers with flaps and full-thickness skin grafts at 7 months of age. Patient developed hypertrophic scarring along incisions. This persisted despite conservative treatment with topical steroid cream and scar massage. Contracture was present mostly along ring finger, causing tethering of distal ring finger with mild radial deviation. Contracture was released with multiple Z-plasties and web deepened with small full-thickness skin graft. At 3 months after surgery, patient was doing well and showed no evidence of recurrence. Hand of 18-year-old patient of Mediterranean heritage who had undergone multiple syndactyly releases with full-thickness skin graft harvested from groin during infancy. Skin graft can be observed as hyperpigmented patches within web space. Some parts of full-thickness skin graft also were noted to be hair-bearing. Parents should be informed of potential sequelae of full-thickness skin grafts as infant matures. I would like to thank Dr. William Dahl, MD, who helped compile new references for this revision.